Description: This event is being rescheduled. More details to come later. Parents and grandparents, bring your child/grandchild to our Fairy Furniture Workshop! 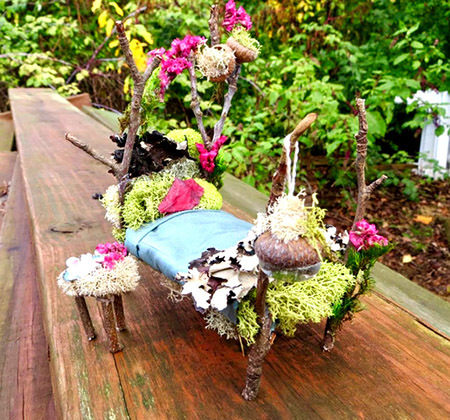 Get ready to make chairs, baby beds, or other comforts for your Fairy Garden. Friday, April 19th, from 9 to 11 a.m. (This is a day many students are out of school). Tilla Marshall and Debbie McDonald will help you make fairy furniture using sticks, leaves, grape vine, champagne cork cages, and other found materials. Please bring your own glue gun/sticks and any "fairy materials" you may have! One registration includes an adult and a child. This is a wonderful grandparent activity. A registered adult may bring a 5 year old or older child with them. However, you do not have to bring a child. Cost for Aldridge Gardens members $20, while non-members is $25. This event is being rescheduled. More details to come later.